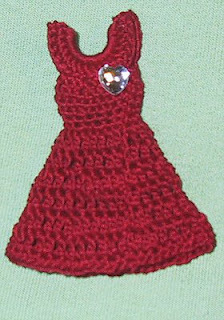 Thanks go to Martina in ID for testing the pattern. 2. 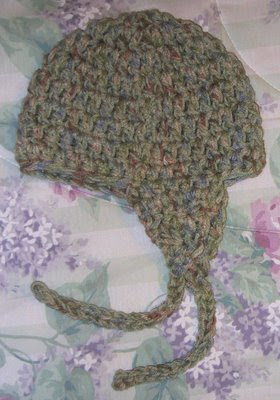 Hat is worked holding 2 strands of yarn at the same time throughout. It can be either two strands of worsted weight or one of worsted and one of a novelty like Fun Fur. 3. Beginning chain 2 doesn’t count as a stitch. 4. Pull slipstitch tight so that it nearly disappears. Round 9: Ch 1(does not count as an hdc), hdc in each st around. Join with a slipstitch in top of first hdc. (40 hdc). Row 5: Ch 2, turn, dc dec over last 2 sts. Do not fasten off. Ch 21, slipstitch up chain. SECOND EARFLAP: Working on the right side, skip 7 st from first earflap for the back of hat, attach yarn with a slipstitch in the 8th st. Complete the same as the other ear flap. Work the first row over the beginning tail. Row 4: Ch 2, turn, dc dec over last 2 sts. Ch 16, slipstitch up chain. SECOND EARFLAP: Working on the right side, skip 6 st from first earflap for the back of hat, attach yarn with a slipstitch in 7th st. Complete the same as the other ear flap. Work the first row over the beginning tail. 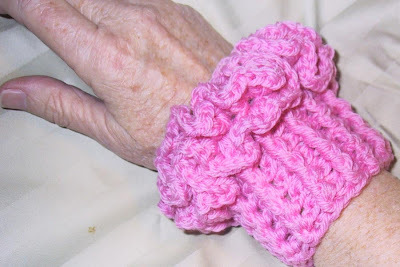 Two ruffles peek out of your jacket cuff. 1. These can be made smaller or larger by changing the length of the beginning chain. Just use an even number of chains. 2. I crocheted some out of DK weight and an H hook. Next I'm going to try sports weight and a F hook. Chain 22 (26) join with slipstitch in first chain. RE-Round 2: Working in the back loop only for this round. Ch 4, *dc, ch 1, dc, ch 1, in same stitch as join. *Dc, ch 1, dc, ch 1, dc, ch 1 in next stitch. Repeat from * around. Join with a slipstitch in 3th chain of ch 4. Slipstitch in chains 2, and 1 of beginning chain 4. Slipstitch in front loop of first sc of round 1. RE-Round 3: Working in the front loop only for this round. Ch 4, *dc, ch 1, dc, ch 1, in same stitch as slipstitch. *Dc, ch 1, dc, ch 1,dc, ch 1 in next stitch. Repeat from * around. Join with a slipstitch in 3rd chain of ch 4.